What makes Poison so durable is their unapologetic style of music. And while other acts of the era frequently alter their approach to the genre with more supposedly profound compositions, including reworked live versions of timeless classics, they instead opt to perform each tune from their extensive catalogue exactly the way they were recorded. The opening licks of the anthemic “Talk Dirty To Me” caused an eruption in the crowd as C.C. DeVille, one of rock’s most underappreciated guitarists, proved his immeasurable worth to the band as he feverishly played each note with the same unbridled passion as the classically trained musician first displayed decades ago. His solo didn’t disappoint on this night as he seemed to gain speed and ferocity the longer it lasted. 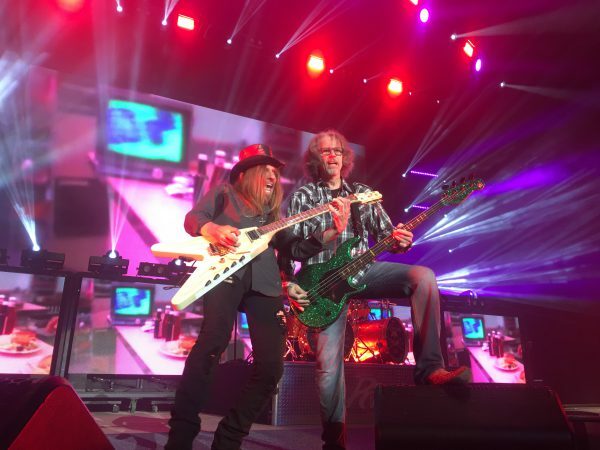 Not to be outshined, however, was the rhythm section tandem of bassist Bobby Dall and drummer Rikki Rockett. Dall, simply put, is a beast behind the bass, while Rockett’s meticulous pounding of the skins is an absolute treat. Combined, they complemented each other beautifully, creating a virtual melodic symphony. 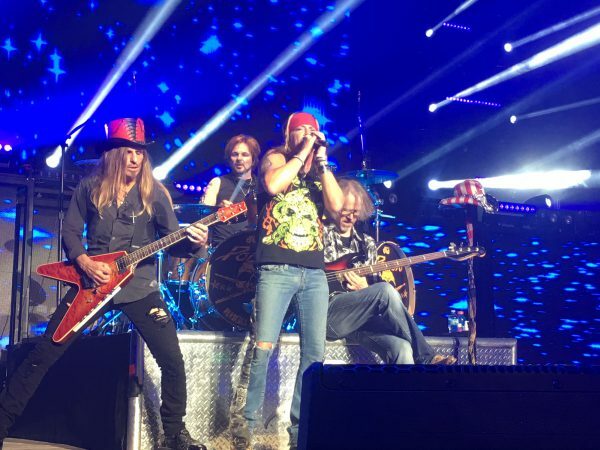 Frontman Bret Michaels made no attempt to conceal his patriotism as he enthusiastically noted his own father’s veteran status and his love for the United States Armed Forces before dedicating “Something To Believe In” to everyone who’s served in the military, inviting several of them to join the band onstage during the poignant performance. But it’s the undeniable charisma of Michaels that has always been the backbone of the group and his energy was infectious on the band’s cover of the Loggins and Messina chart-topper “Your Mama Don’t Dance” as well as fan favorite “Fallen Angel,” both off of 1988’s Open Up And Say…Ahh! A riveting encore of Kiss’ “Rock And Roll All Nite” was given an added touch of flair as two members of Pop Evil, the evening’s deliciously heavy opening act, vocalist Leigh Kakaty and bassist Matt DiRito, joined the band onstage to help belt out the beloved tune. The Michigan-bred Pop Evil led the night off with a haunting set, blending distorted double guitars from Nick Fuelling and Dave Grahs, along with the powerful drumming of Hayley Cramer, and the smooth bass work of DiRito. 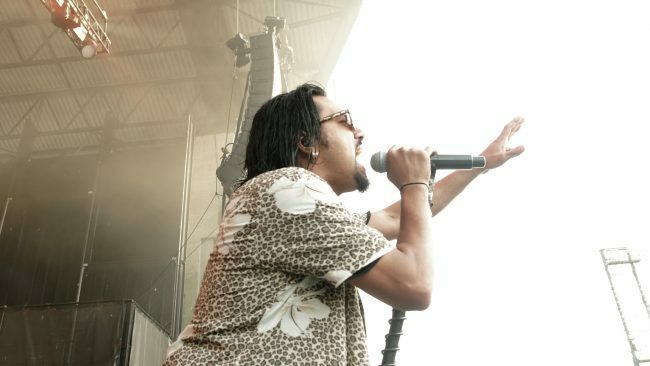 Kakaty’s evocative vocal prowess quickly won the audience over on songs like “Boss’s Daughter,” “Be Legendary,” and closer “Trenches,” in which the singer trekked through the theater, greeting and high-fiving fans in each section he passed through. 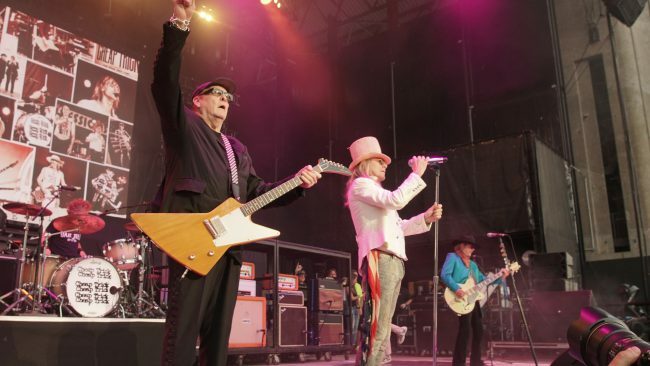 While Pop Evil didn’t form until the 2000s and headliners Poison personify the 1980s, Cheap Trick could be considered the show’s elder statesmen, with their origins dating back to the mid-70s. But don’t be fooled – there was no going through the motions with these classic rockers. 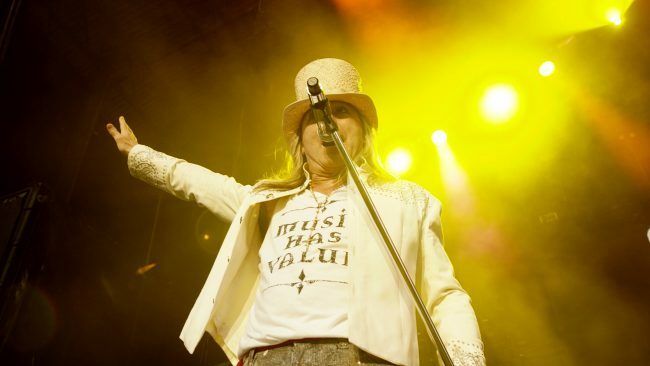 Singer Robin Zander, in his trademark white top hat, looked and sounded like he took a dip in the Fountain of Youth as he guided guitarists Rick Nielsen and Robin Zander Jr., bassist Tom Petersson, and drummer Daxx Nielsen – yes, Cheap Trick is now a family affair – through hits and deeper cuts. As “Hello There,” “You Got It Going On,” and “California Man” sufficiently broke the ice, it was “If You Want My Love” that truly ignited the spark for the throngs of diehard fans of the Rockford, Illinois band. 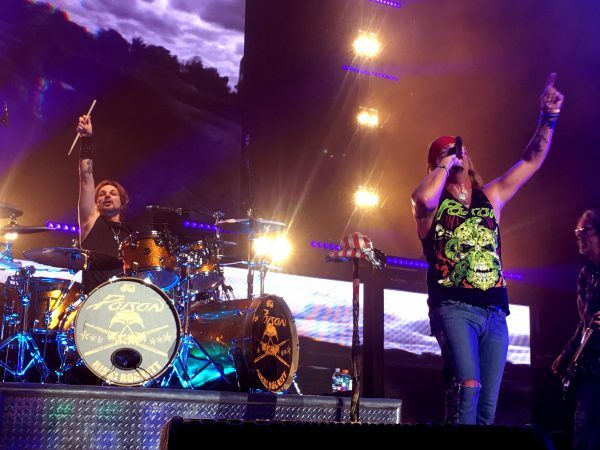 Click here for Poison/Cheap Trick/Pop Evil tour dates.